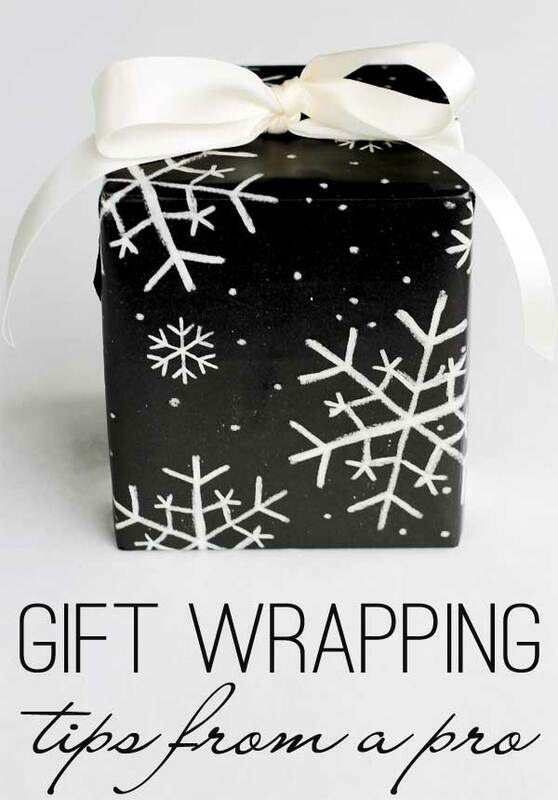 Wrapping gifts is one of my favorite things about the holiday season- pretty paper… pretty ribbons… all the pretties! This year I asked my friend Kasey to help me, and I had no idea I was doing it all wrong! I thought I was doing it right – I mean, they always turned out pretty. 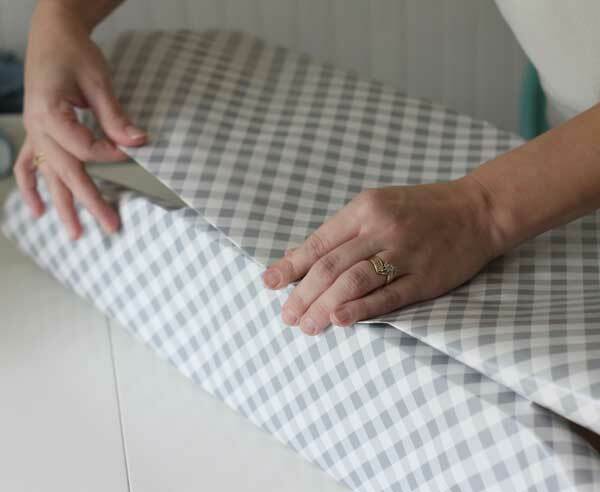 As a former department store manager, she not only wrapped about a bazillion gifts in her retail days, she also trained others on how to do it properly, too. 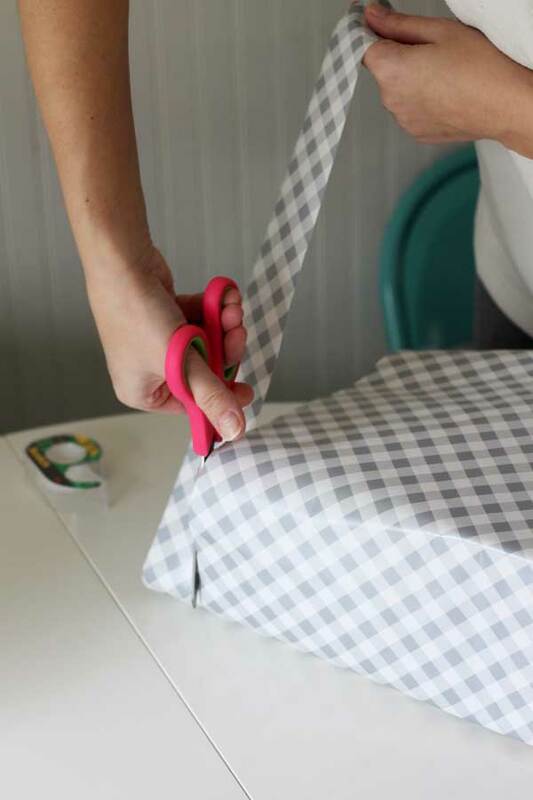 So as she started wrapping I was amazed at her technique – and I ran to grab my camera and started snapping photos because you’re going to love her tips on how to wrap a gift. 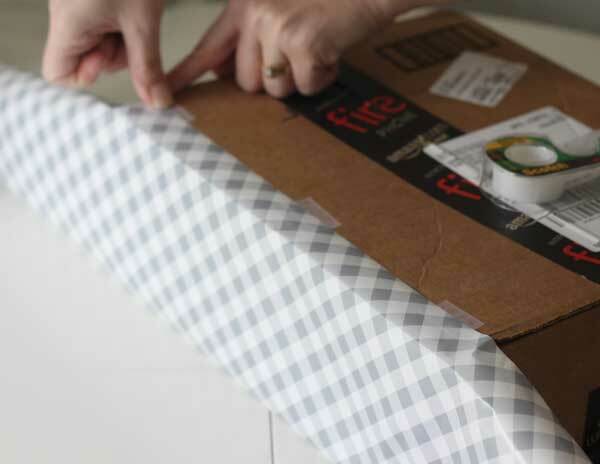 Start by cutting a piece of wrapping paper that is a 3-4 inches larger than your box. Flip the box upside down and work from the bottom side. Take the edge of the paper and pull it about 1 1/2 inches from the edge of the box. 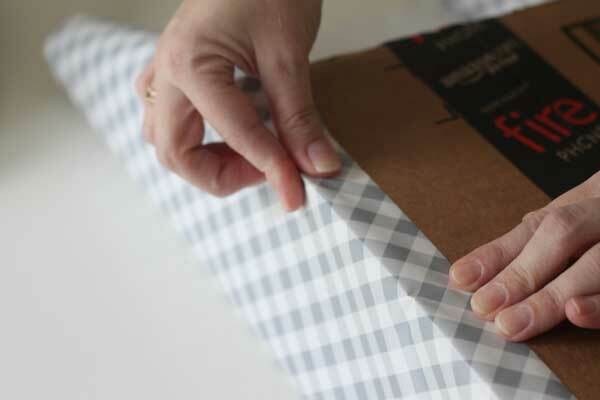 Using your thumb and index finger, smooth out the edge to make a crease to keep everything neat. 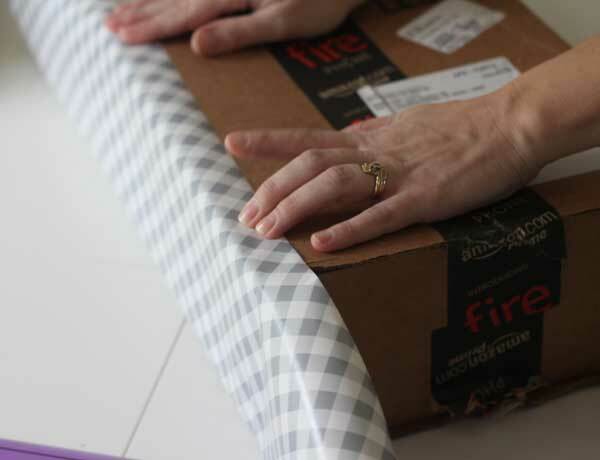 Tape down the paper on each end and in the middle – even more if your box is especially big. You want tape every 6-8 inches to keep it nice and secure. 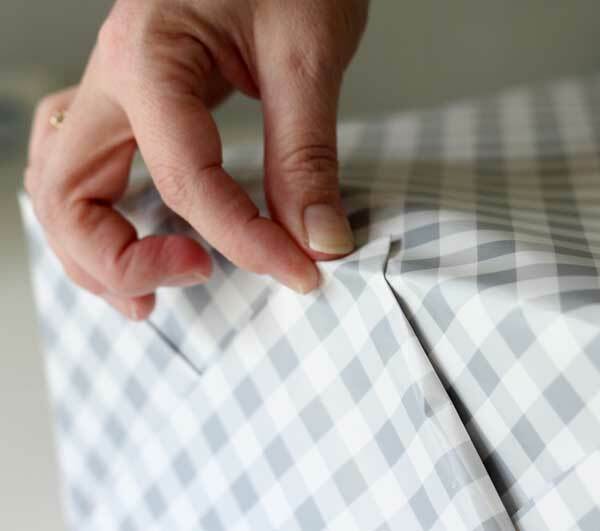 Fold over the paper from the other side, getting it smooth against the box all the way around, then use the edge of the box to create a crease. 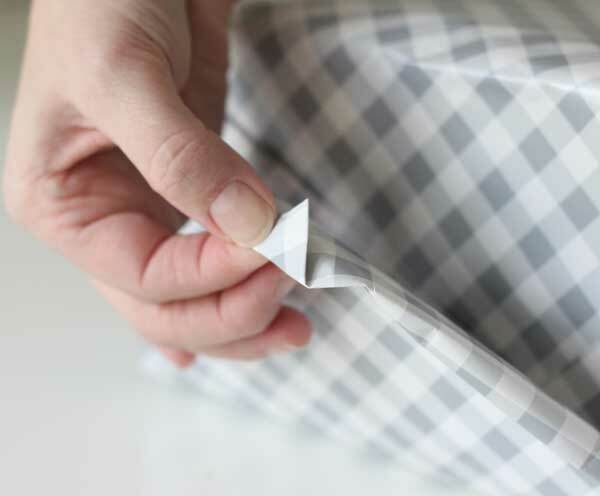 Using the crease you just created, fold the paper all the way across. This makes it fit the box perfectly. Line up the paper with the edge and make sure it’s flush. Next, trim a bit of paper off each end (if it’s too long). It’s better to trim a little and then trim a little more than to trim too much. You want to trim about an inch longer than the box is tall. Still working upside down on the box, fold the paper into the bottom edge (against the table) so it’s flat all the way across. 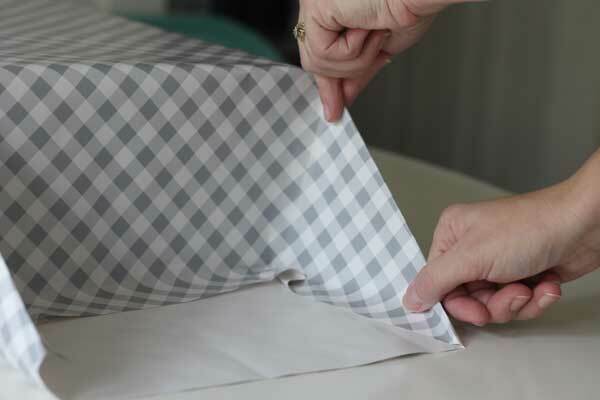 Tuck it into corners to keep things nice and neat. 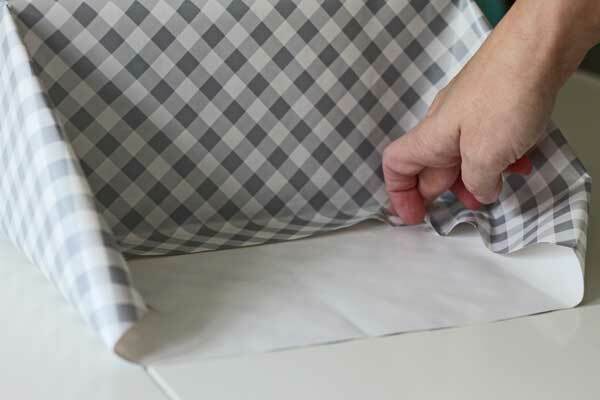 Use your fingers to create a crease on each side where the paper comes off the corners. Then fold in each side to create a V on the bottom. Smooth out all your edges so everything is as neat as possible. Don’t tape yet – you’ll get there in a bit. Fold the paper up so it covers the end of the box. Now, the magic of having the paper too big is that you’ll have a tiny corner tab. 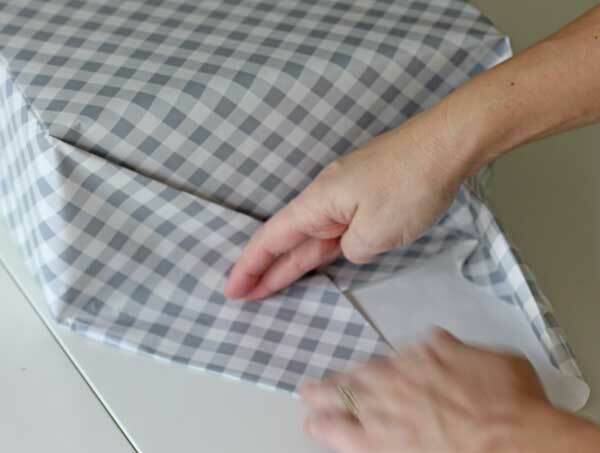 Fold it over the edge of the box and give the edge of the tab a crease. 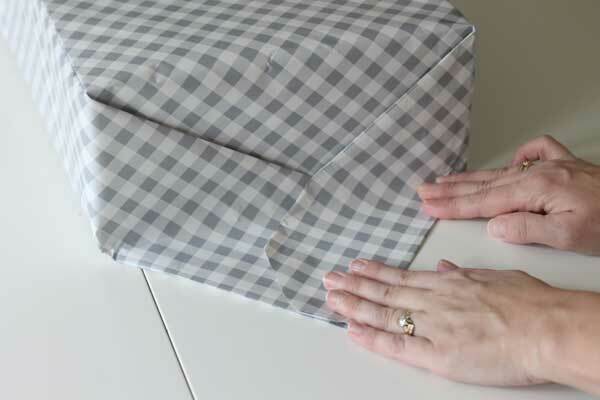 Fold the tab under so it meets the edge of the box, then tape it down. 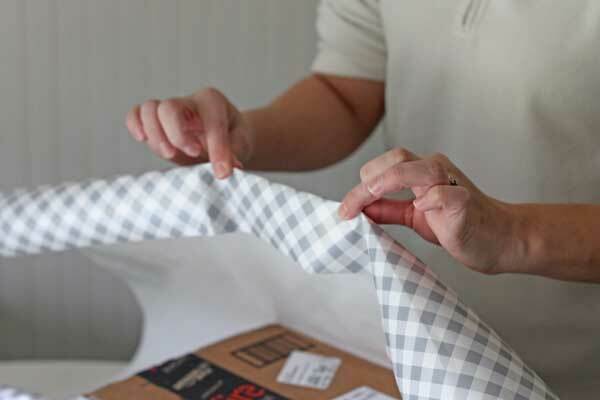 Now use double sided tape to secure the flaps on the ends. See – no tape showing! Now do the other side the same way. Lastly, go all around every edge of the box to get a crisp, clean line to make everything neat. 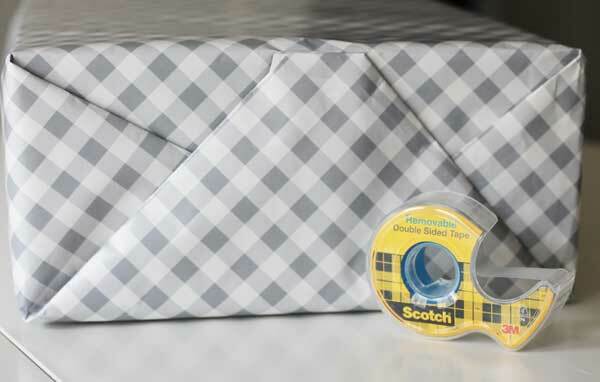 And that’s how to wrap a gift. I had no idea I was doing it all wrong all these years!